These images were taken about 10 minutes ago as my son’s had to abandon their badminton game due to a rather large visitor! 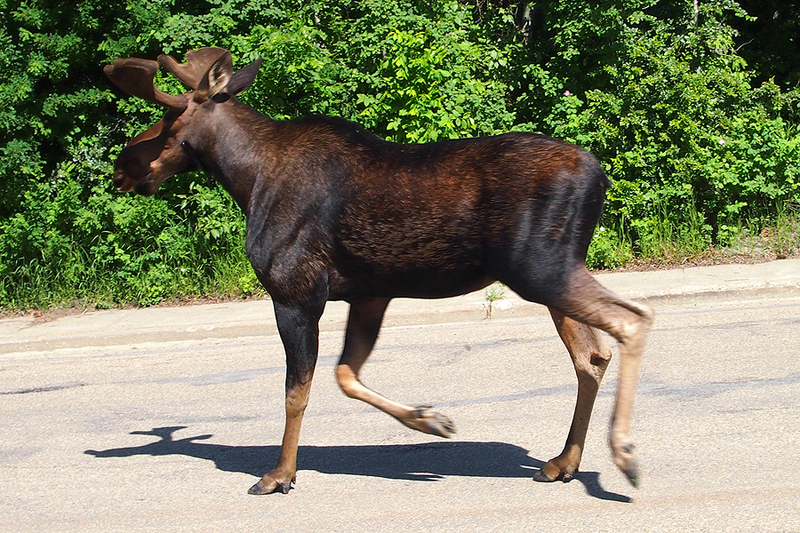 What luck to see such a big animal up close. He also had the courtesy to trim my crab apple tree for me. We were out at the cabin again this weekend. We glanced out to the lake just at the right moment to see two pelicans gliding by. We always think it is such a treat when we come across them as they are so different. A cropped in image of the pelican. The next day we were out and I noticed my husband was driving a rather odd route to our destination. I asked him where we were going, and he said he wanted to take a quick look to see if the pelicans were still around. We stopped at the part of the lake where we expected to see the birds, but not a single pelican was on the water. Then, by chance, we looked up to see pelican after pelican flying overhead. What a sight! I have finally finished the canvas that has been on my easel for months. 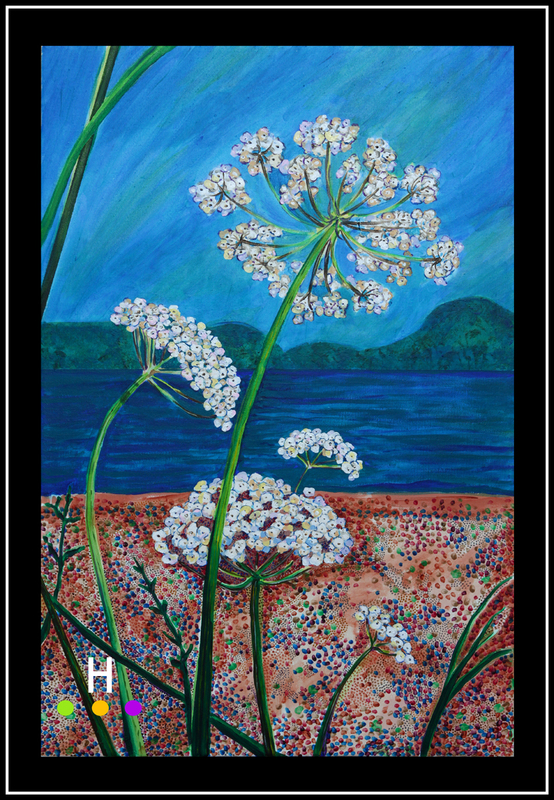 It is a painting inspired by the yarrow that grows wildly along the banks of Hamilton Beach on Pender Island. The painting measures 24 inches by 36 inches, and is acrylic on canvas. Hamilton Beach will lead you along to the marina and pub at Port Browning. The marina is a great place to check out all the boats while the pub has fabulous fish and chips. Trust me, there is nothing better than eating fish and chips on a beach after an afternoon of kayaking. The above photograph is what inspired the painting. Of course the painting is far from a photographic representation with my love of pattern and bold color. I am looking forward to finally hanging the painting on the dining room wall in our place on Pender; it will add a lot of color to a very beige wall. Island Home is where I share my images and experiences of Pender Island, British Columbia. Now that I have your attention! LOL! This is just a quick post for those who follow www.htheblog.wordpress.com and www.debrahunter.wordpress.com . In the next few days a few posts that have already appeared on “H……the blog” will be appearing on “Debra Hunter – photography and art”. I thought I would just give everyone the “heads up” rather than leave you thinking “Hey didn’t I see that before?”. This just seemed to be a sensible way to set up the framework for the new blog and give it a bit of a kick-start. Within a week or two it should be all new content! Our mid-week get away let us experience a windy and soaking rain storm. Once the storm moved to the east we were left with stunning colors and wildlife popping out all over. In addition to many types of birds, we also managed to see a muskrat, two deer and a fox….all in a matter of a few minutes. We were thrilled to see the fox, unfortunately he was quicker than the camera! I’ve decided to start another blog to focus on my art and “serious” photography. I will continue to blog all the fun stuff here at H….the blog. Feel free to pop on over and visit the new site. I aim to get some fresh content up on it very quickly.